At this time we have only one submission to our Navy Scrapbook Layouts, but I and my readers would certainly appreciate it if you would post your own for us to share. 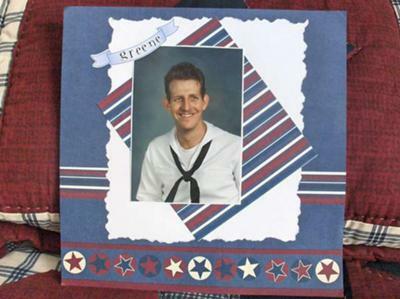 You can see our first Readers Gallery posting Navy Scrapbook Layout from Kathy in Nashville. Please go to her page and comment and/or vote for her submission. I don't have the privilege of knowing anyone in the U. S. Navy, but I'd like to have the opportunity to honor your U. S. Navy Hero here on these pages. Whether it be a Commissioning or Promotion Ceremony or a tour of a Naval vessel, we'd sure like to see what you have done. You will be helping my readers with great ideas and sharing your art work with other scrappin' enthusiasts. Once you enter your photo(s) for your Navy Hero tell us a little about your hero and what items you used to do your Navy Scrapbook page or Navy Card, our moderator will set up a page just for you on our scrapbook-advice.com website. They you will receive an email from us, giving you the link to your page. We hope that you will send the link to your friends and family so they can comment and rate your work. After the 10th Military Scrapbook Layout or Military Card has been posted, we will wait 2 weeks for the comments and votes to come in. We will pick the winner from the highest rankings. After the winner is chosen, we will send an email to get your snail mail address to mail you your gift or gift card. You may enter each contest up to 8 times. Good Lucks and thanks for posting and commenting. Have a Navy Scrapbook Layout you would like to share? Show us your personal tribute to honor the service of your special Naval Hero. Whether its a Scrapbook Layout or a card with a Navy theme, we'd love to showcase it on our website www.scrapbook-advice.com. Enter the Title: Example "My Naval Scrapbook Hero Layout about my Dad"
You can also enter your Military Scrapbook Layouts and Military Cards for the Air Force Scrapbook Layouts, Army Scrapbook Layouts, Coast Guard Scrapbook Layouts, Marine Scrapbook Layouts, Firefighters Layout Gallery, and Police Scrapbook Readers Layouts. Don't forget to enter your submission for the free prize to be awarded with every 10 Military Scrapbook Layout entries.